Inspiration for the bike first came from one I saw in a second hand shop in Milton. I thought I could possibly make one of those so I started mine six months after I saw that one. 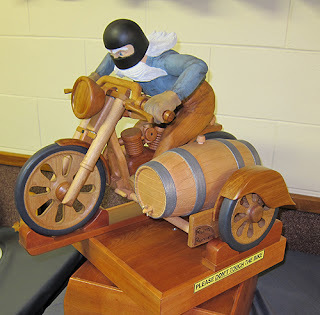 My bike however became a lot bigger and I also included a barrel sidecar plus rider. a side elevation to start with with then trial and error until I got the proportions right. For the rider I took photo's of my granddaughter sitting on her pushbike and then I made cardboard cutout of a rider using these photographs and then went along from there. The body and head is carved from one piece of wood, the legs separate from Rimu. Oak, Beech and Rimu were used so as to give depth and separation of color. and riders body are finished with Danish Oil. 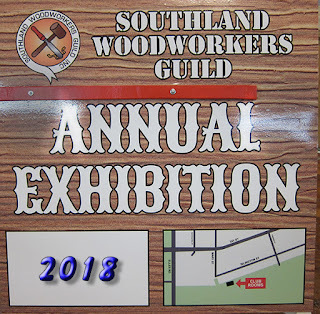 The annual southland woodworkers guild exhibition got under way on Friday the 16th November with all exhibits being delivered and put into their respective categories ready for judging. This process went very smoothly this year with good work from a number of members who used the computer to make labels for the items . There is too many members to thank for all their sterling work in getting the exhibit up and ready. The thanks goes from the members that painted the main exhibit room , cleaned and tidied and set out the tables and displayed the exhibits and also the items the guild has for sale- all in one place. The judges this year were Lisa from Arts Murihuku and Lisa- Maree from ILT Foundation. The wood worker judge that assists the judges was Maurice Caughey - and what a great job they did. Our thanks goes out to the judging as they had a really difficult time picking the overall winners. we certainly have some talent amongst our group. The night went extremely well, each winner had their photo taken with their item and they could make a comment or speech if they wished. Some told the story of why they built their item and where the wood came from – all great stuff as each item made has its own story and how issues during construction were overcome. – Merry Christmas - is just round the corner. 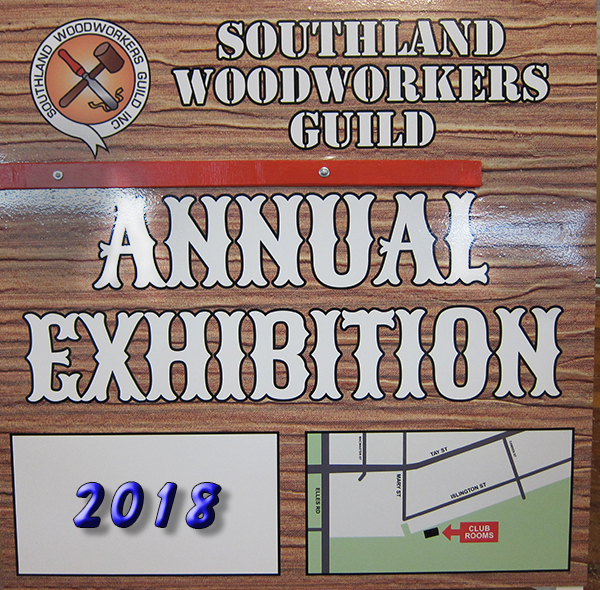 And finally my special thanks to all those members that put their hard work up for the exhibit – we have a vast array of skills and the annual exhibit is the place where we can display our work and have it admired by the public.